REGISTER: Email info@nhppa.org with your first and last name and we’ll get you the Zoom Meeting ID login information. Use subject line: Cannabis Zoom. Feel free to send a question along. The call will be recorded for those not able to attend. Share with colleagues who you think need to know. With all the fanfare about cannabis becoming “legal” in October, health practitioners might be surprised to learn that the use of many forms of medicinal cannabis is still strictly forbidden. At the same time, the police are inconsistent in enforcing the law because of the grey area created by a Supreme Court of Canada decision. 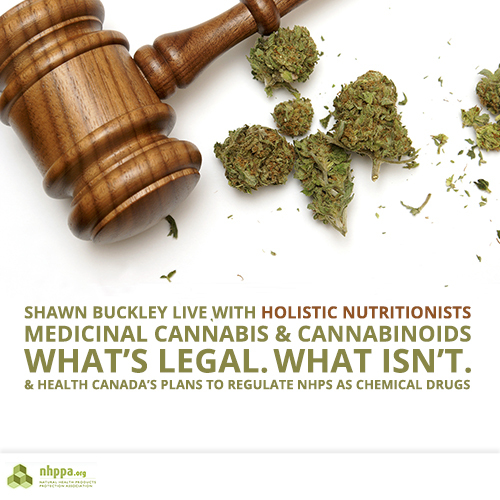 In this webinar Mr. Buckley will discuss the law surrounding medicinal cannabis, and how practitioners should structure their practice if they are going to be selling cannabis or cannabis products. Worse than Bill C-51 – the upcoming changes to the regulation of NHPs. The plan is to regulate natural products under the same set of regulations as chemical non-prescription drugs. Likely the compounding exemption for NHPs will be lost. Claims will be further restricted. The use of traditional evidence for efficacy claims will be lost. NHPs will have to comply with the same standards of evidence as chemical drugs. Finally, the powers and penalties so many of you fought against in the Bill C-51 campaign will be applied to natural products. That could mean fines of $5,000,000 per day. Nutritionists need to learn about the upcoming changes and what they can do to stop them. Mr. Buckley will briefly touch on this theme as an introduction. Over the next few months we will be holding independent practitioner calls with Homeopaths, Naturopaths, Functional Medicine Practitioners, TCM Doctors, Integrative Medical Doctors and more.